Successfully Added Exclusive 10.2 Inch Netbook to your Shopping Cart. Exclusive netbook with 10.2 inch widescreen LCD and modern connectivity features. The mini netbook (often called an eee pc) is an elegantly designed portable computer with half the size, weight and price of a regular laptop. This a wonderful new computer product that is great for an entire afternoon at Starbucks, relaxing at the beach, and especially good for light packing business travelers. Slip it in your messenger bag or purse and you're always ready to connect and turn heads with its distinctive color and style. The Mini Netbook comes fully loaded with all the spec's you'll need. Its signature features include a lightning fast start-up speed, large and vibrant 10.2 inch widescreen LCD WSVGA LED backlit display, fast 1.6 GHz processor, 1 GB of installed RAM, 120 GB hard drive, high speed wireless 802.11B/G, and integrated webcam for easy video chatting. With looks like the Ferrari of all laptops, the PC01 Netbook's smooth surface and well designed keyboard is comfortable to touch and a great choice for anyone who likes to show off their style. Most importantly, the PC01 netbook ships clean (with no pre-installed OS), so you can install your favorite operating system. Use the bundled external DVD/CD-ROM drive to install your favorite flavor of Windows. For example, if you like Microsoft Windows but hate Vista and all the junk software that most PC manufacturers are pre-installing on PC's these days, then here is a model with a clean slate that you can use to install Windows XP on! A great wholesale price makes this Exclusive 10.2 Inch Netbook perfect either for the resale market, OEM market, or for personal/company use. As always, it is only available from your source for wholesale direct from China electronic products, Chinavasion Electronics. 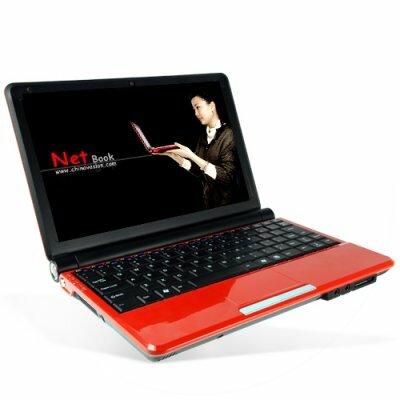 The mini netbook is an elegantly designed portable computer with half the size, weight and price of a regular laptop. The PC01 netbook ships clean (with no pre-installed OS), so you can install your favorite operating system.. Designed with ease of use in mind - both with compact size and convenience like front side multi-format memory card reader, multiple 2.0 USB ports and speakers.